A large number of high-end enthusiasts and prosumers are expecting a lot from the next enthusiast level upgrade. While Haswell on the mainstream desktop has been here a year, Haswell-E is still a number of months away. Computex seems to have shown a few X99 chipset models, the chipset designed for Haswell-E, and it looks set to be a significant upgrade in terms of functionality. 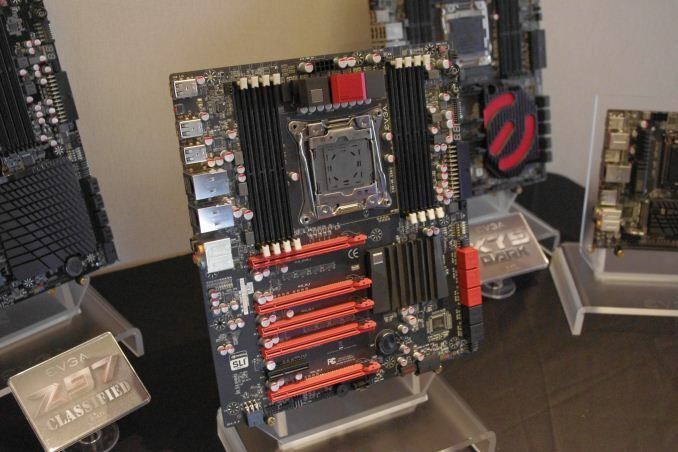 Most of the major motherboard manufacturers had something on display for X99 – some were out in the open whereas others were behind closed doors and we can’t talk about them. EVGA was happy enough for us to take images of their X99 demo sample, which is almost final in terms of functionality but still needs some work on the aesthetic look. For X79, EVGA came out with the X79 Dark, the X79 SLI, the X79 FTW and the X79 Classified. This model definitely looks to be in line with the Dark, as that was the only model with a full complement of DRAM slots, but the color styling is more the regular EVGA style. 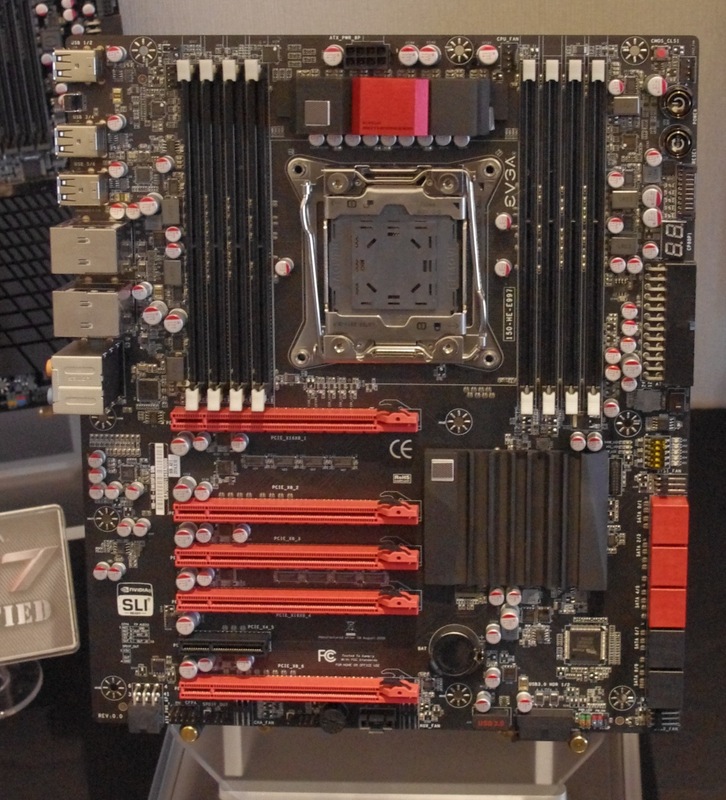 Due to the size of EVGA, the functionality on their motherboards is not in the same area as an ASUS, GIGABYTE or ASRock, but they do attempt to be versatile, especially with the PCIe layout. There the GPU layout should be suitable for two 3-slot cards, three 3-slot cards or four dual slots cards. Users can adjust the air gap in a dual card setup to fit their needs. 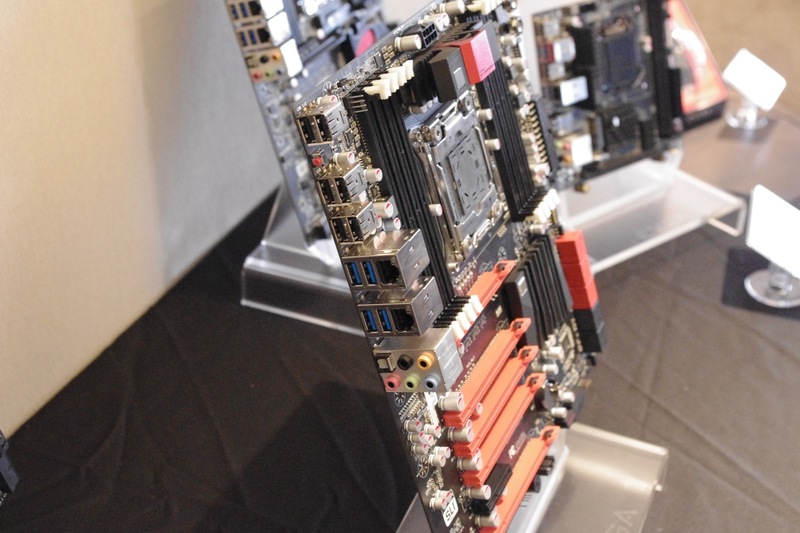 The board does come with dual NIC (Intel I218-V I believe), 10 SATA ports, PCIe switches and extra power to the VGA comes via a 6-pin PCIe connector. EVGA also put their 24-pin ATX power connector at right angles, and is the only company to go down this route for X99 so far. 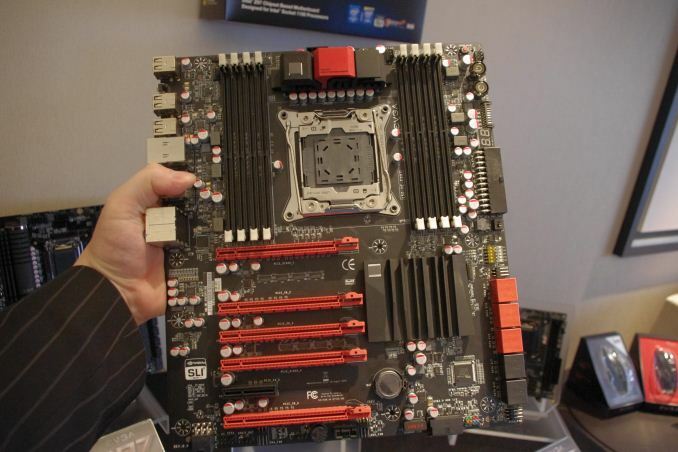 The heatsinks in these images are just for function, but will be replaced with the EVGA branded ones come release. Jacob from EVGA expects the motherboard to be available for X99 launch, which is always a good thing. "i think they changed the spec of ddr3 to allow more than one dimm - some xeon motherboards even had 3 dimms per channel"
DDR4 is point-to-point like FB-DIMMs. Going to more than one DIMM per channel requires either registered or load reduced DIMMs from my understanding. Unbuffered memory is limited to 1 DIMM per channel.